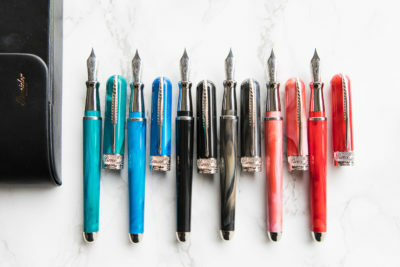 Hello ink friends! 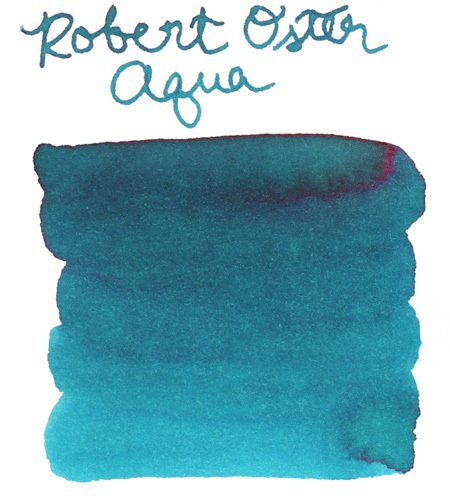 I have another great ink I got to try out this week! 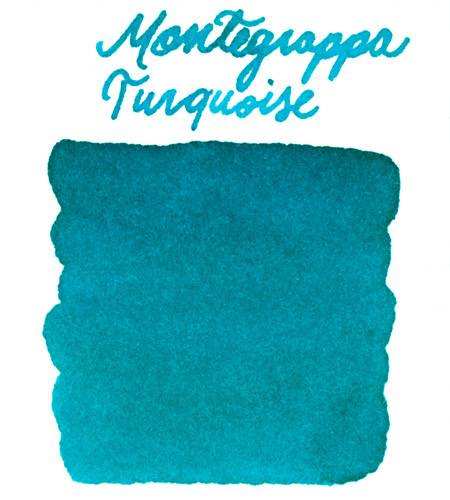 I haven’t written with many Graf von Faber-Castell inks in the past, so I was interested to try one of their new inks, Turquoise. 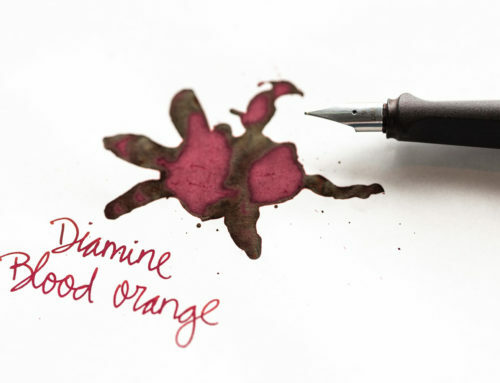 This ink is one of my favorite shades to write with, so I was especially excited! 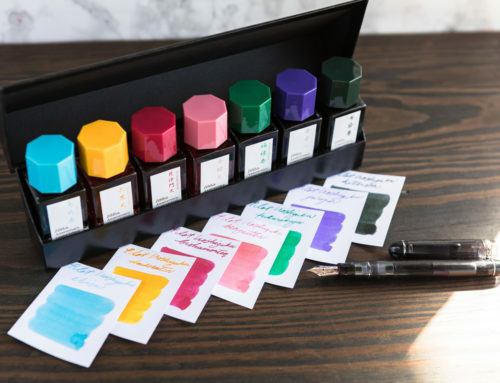 About 25 seconds– The ink still smeared at the 20 second mark, but not at the 30 second, so it dried at some point between those two. 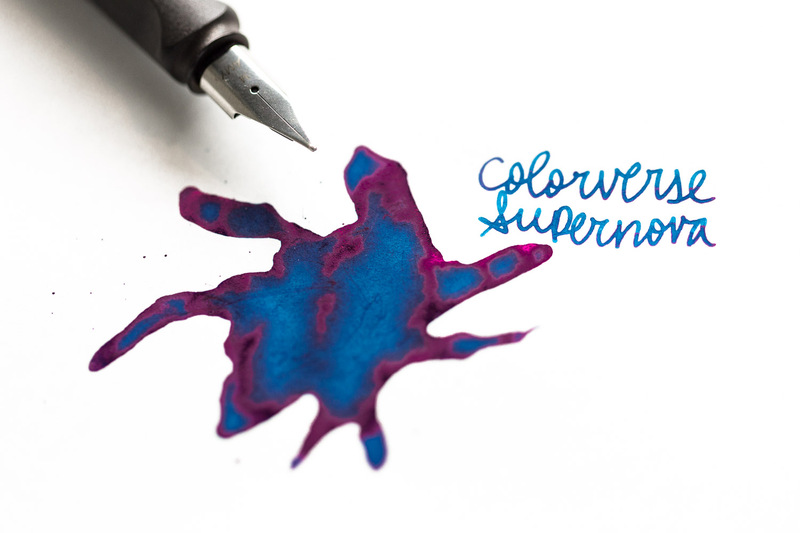 Medium – While the ink smeared, you can still definitely see what was left behind after the water was applied. 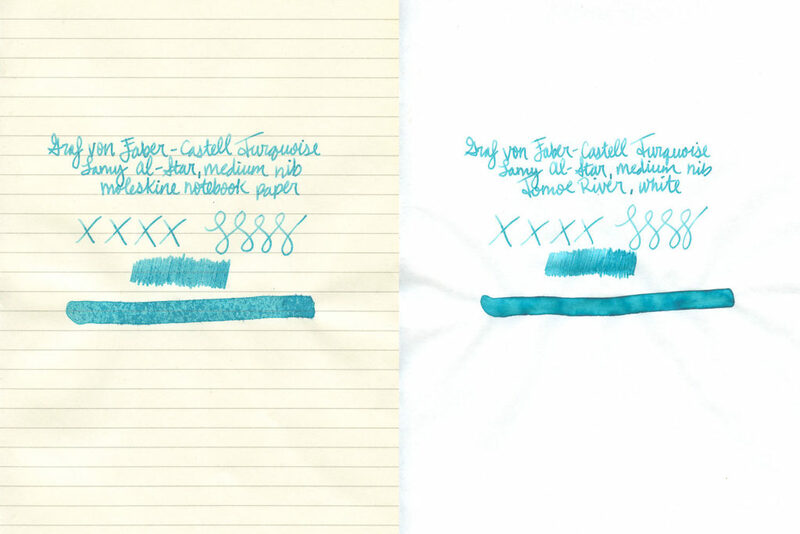 Medium – The ink didn’t look very saturated as I was writing, and the swab test only showed much difference between swabs 1 & 2. 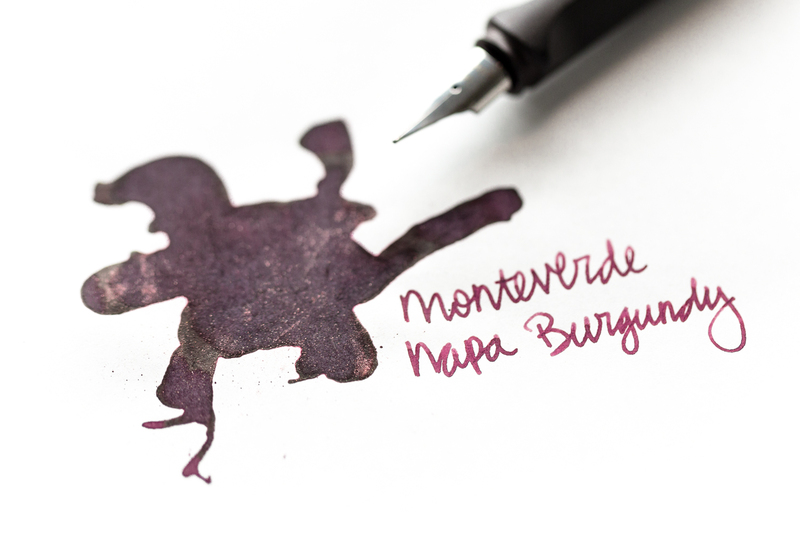 Easy – I found that the ink flushed out of my pen pretty quickly and easily! 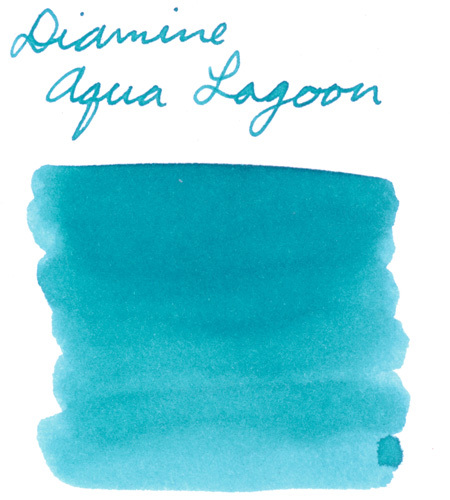 Medium – While the ink didn’t have much shading, I gave it a medium because it wasn’t one color through every stroke- some of my downstrokes were a bit darker in color. 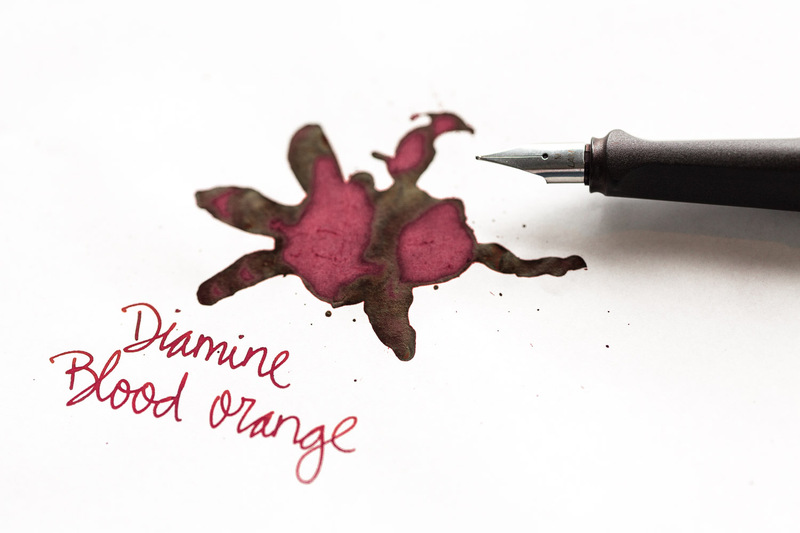 Medium – The ink flowed relatively well out of my nib, but it wasn’t very wet by any means. 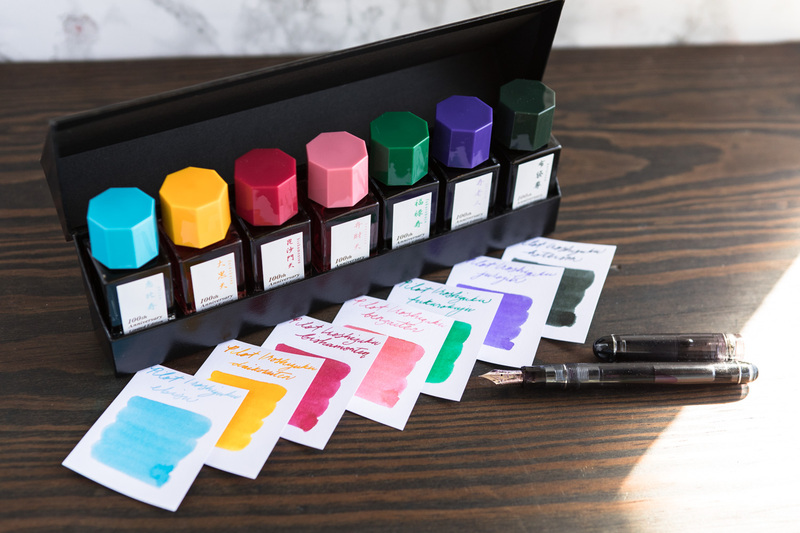 The bottles that the Graf von Faber-Castell inks come in are really lovely. 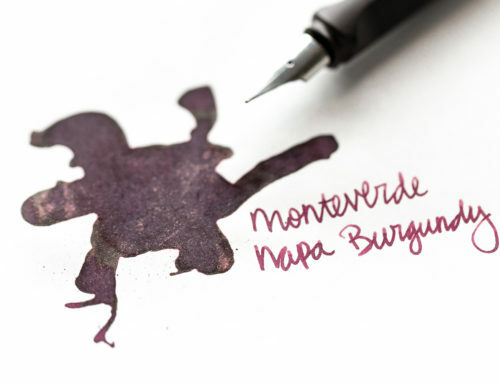 I find the rounded edges really aesthetically pleasing, and I think the bottle would look great displayed on a desk. 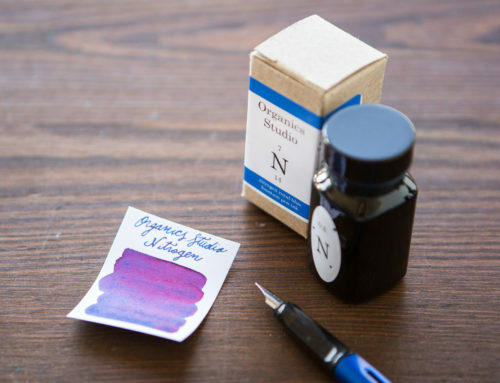 Overall, I liked this ink! 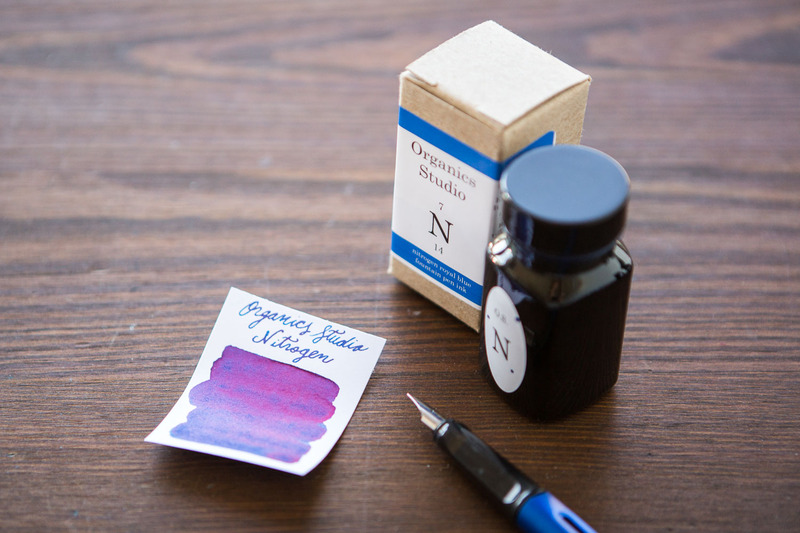 It wasn’t quite saturated enough for my liking to be one I would write with all the time, but it’s a great color! 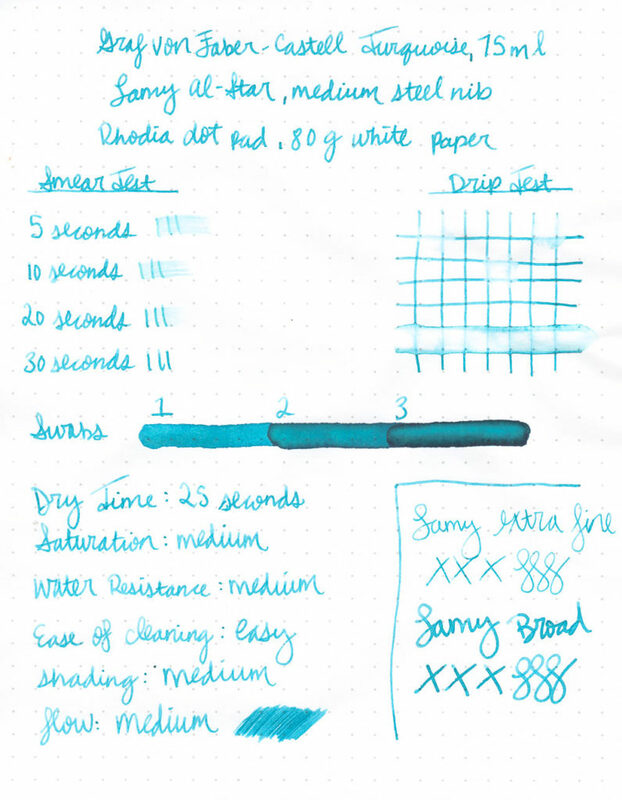 It flowed nicely, and I feel like the color still falls within a safe spectrum to be used in most settings. 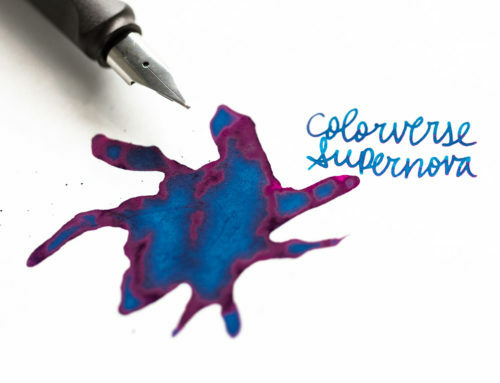 The water resistance is also appealing, because you could spill water on your writing and still have a good chance of being able to read it. 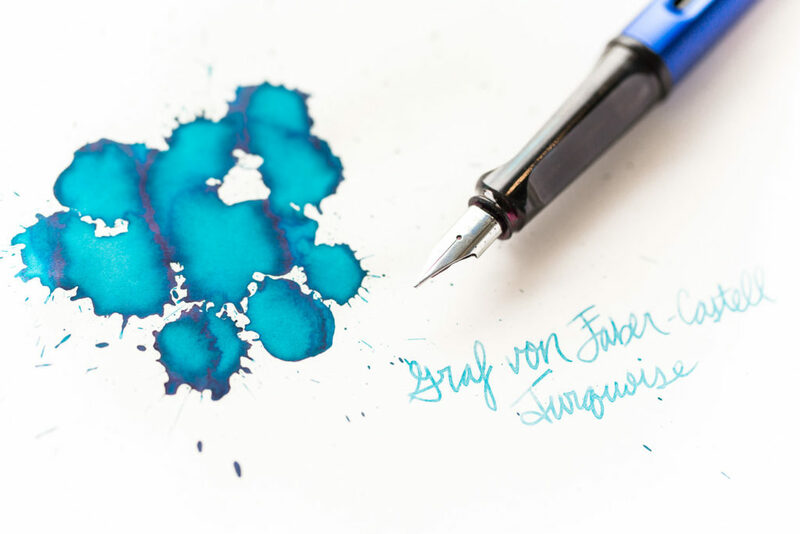 You can find a 75ml bottle of Graf von Faber-Castell Turquoise at GouletPens.com for $30, or a 2ml sample is also available for $1.75. 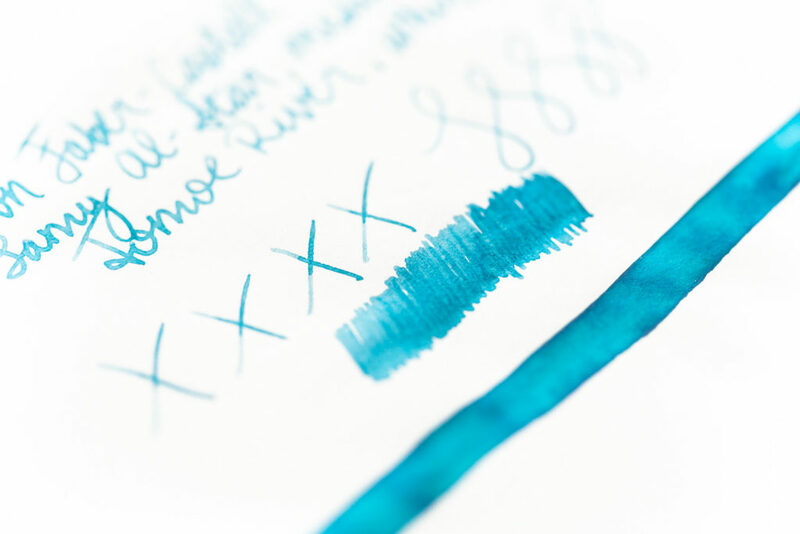 Do you have a favorite turquoise ink? Leave a comment and let us know!